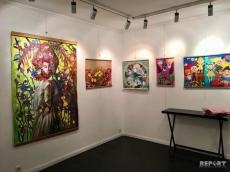 The paintings of national artists have been displayed at the exhibition "Music of spring" in Paris. The event was co-organized by art gallery "Delicate morning beauty" and Togrul Narimanbayov's Association, Report.az informed. At the exhibition, Azerbaijan was represented by members of Colorful sensations Art Studio under the leadership of Narmina Veliyeva. Along with the landscapes reflecting the coming of spring and revival of the nature, the exhibition also featured the paintings depicting the popular traditions, carpets, national clothes, oil wells and monuments. The French audience highly appreciated the paintings by Azerbaijani artists. The works by representatives of Georgia and France were also showcased. The exhibition will last until March 20.